Big changes to EJCDC's Construction Series 'make life better' for project participants. 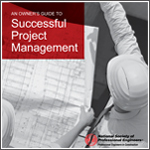 Whether you're a professional engineer, owner, or contractor on a construction project, the ultimate goal is to complete a project on schedule, within budget, and with as little conflict between parties as possible. This is likely the best case scenario if not a dream scenario. The Engineers Joint Contract Documents Committee has long sought to help engineering firms, owners, and contractors to establish fair contractual agreements through its contract documents. In March, EJCDC launched the new 2013 edition of the Construction Series (C-Series) documents to reflect today's best practices. The Construction Series contract documents are typically used when an owner hires an engineering firm to design and set specifications for a project while a contractor is obtained to perform the construction work. The substantive changes and additions to the document series seek to alleviate construction project conflicts with change requests, reduce litigation, and address challenges posed by an evolving risk management and insurance market. Jim Brown, P.E., chair of the EJCDC Construction Documents Subcommittee, believes that all parties—the owner, project engineer, and contractor—will be satisfied with the new contract content. "These contracts are the result of having various professionals currently working in the industry around the table," says Brown, who is vice president of Malcolm Pirnie/ARCADIS in White Plains, New York. "We talked about the issues and developed ways to make life better for everybody involved with these projects." 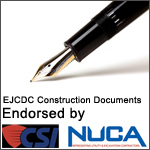 Established in 1975, EJCDC has set out to develop fair and objective contract documents for the construction, engineering, and design-build industries. NSPE, the American Council of Engineering Companies, and the American Society of Civil Engineers are partners in the organization. EJCDC also engages other professional engineering design, construction, owner, legal, and risk management organizations to develop the contract documents. Since the 2007 release of the Construction Series, the subcommittee has collected input and feedback about the documents and industry issues in preparation to update the documents in a five-year cycle. "The first thing that we do when we work on a new series is to pull out those items from the 'icebox,'" says Brown, a former EJCDC chair. Are the 2007 documents obsolete? According to EJCDC General Counsel Hugh Anderson, they can still be used in conjunction with the updated documents. "The 2007 documents are perfectly good documents—we have just made them better," he says. The contract documents also have been modernized and allow for the parties to formalize everything digitally. Joe Eberle, P.E., recalls the days when EJCDC produced only printed documents, but those days are long gone. "We are recognizing the way the construction world is going," says Eberle, a subcommittee member and engineer with Ruekert & Mielke Inc. in Waukesha, Wisconsin. "This is good if it saves time and money and benefits everyone." Brown says the subcommittee, recognizing that disputes can lead to adversarial results, took a very hard look at attitudes on construction sites. Contractors expressed concerns that time constraints make it difficult to deal with issues lingering in the background and settle disputes. In addition, filing a claim typically has been the only way a contractor could initiate a change on a project, request additional time for completion, or request increased compensation. To acknowledge that these contractor requests are routine and aren't intended to be antagonistic, the Standard General Conditions (C-700) document defines an additional request for time or compensation as a "change proposal." A change proposal should be submitted to the engineer and followed by an informal resolution process. If the issues are not resolved by this first step to the satisfaction of both parties, the contractor may file a claim (this also applies to the owner). The contract also allows the owner and contractor to retain a mediator to assist in resolving claims. "The strict timeline didn't provide the best conditions for the parties to talk and resolve issues," says Brown. "We changed the process to a two-tier dispute resolution before it really becomes a claim and goes to either arbitration or to court." Eberle agrees that changes were necessary to create an environment in which the owner, contractor, and engineer aren't pitted against each other. "If a contractor has a better way of doing something, he should be able to submit that to all parties and they should be able to discuss it," he says. The new dispute resolution process in the contract makes changes to the engineer's role. The engineer is removed from involvement with project matters that don't involve design or technical issues, including involvement in the claims process. Changes to drawings and specifications still require the engineer's recommendations and signature on change orders. The general conditions document also clarifies the standard procedures for determining whether substantial completion has been attained and for the transfer of liabilities and responsibilities at substantial completion. Contractors may discover that the conditions specified during the bidding process aren't what they find while out in the field. Revisions to the C-700 document clarify the procedures and roles for responding to "differing site conditions." A default definition of the contents of a geotechnical report for a project was established, which includes boring logs, laboratory test results, and water level data. There is also a supplementary condition that gives the owner the opportunity to use a geotechnical baseline report as the measure for determining if the subsurface conditions "differ." Working in the fields of risk management and insurance requires EJCDC to stay current with changing practices. Anderson worked with insurance brokers and risk management experts to compile updated requirements for construction work. The insurance market is constantly evolving in areas such as terminology, requirements, and expectations of insurance companies, he says. "The insurance requirements in the documents now provide as much protection to the owner and the contractor as possible," says Anderson. "They are practical and feasible in setting commercially available terms that the contractor, for example, can meet in purchasing commercial general liability insurance or an owner or contractor can meet in buying builder's risk insurance." When it comes to builder's risk insurance, the documents contain more specifics about causes of loss that a policy has to insure and procedures for receipt and distribution of insurance proceeds for a covered loss. The standard "default" requires the contractor to obtain this insurance, but provides the owner the option to maintain the authority of obtaining this policy by using an optional supplementary condition. Additionally, the C-700 document updates include requirement for contractor's professional liability insurance and pollution liability insurance, which are essential to typical infrastructure projects. There is also a revision for notification when a mandatory policy is being cancelled or is lapsing, and there is a reduction in the advance notice time and the number of parties that must be contacted. Kent Lackey, P.E., used his 19 years of administration experience in construction and projects in the municipal wastewater industry to help the subcommittee ensure that the updated documents reflect current best practices. He thinks that it is essential that the documents help users to navigate difficult risk management and insurance issues. "Having a comprehensive insurance provision that can be adapted in these contracts is important," says the incoming EJCDC chair. We have provided tools that they can pull from in these documents." In addition to the substantive changes to the Standard General Conditions, C-700 document, three new standard documents have been added to the series. The document provides owners a platform to inform potential bidders about the project and invite them to obtain the bidding documents for review. This document is for use in obtaining information regarding experience and capabilities from contractors, whether in a prequalification or bidding phase context. This document is a standard subcontract that meshes with the EJCDC owner-contractor documents. Lackey believes that the updates to the contract series will be greatly valuable to the industry, particularly the change provisions. He expects to get first hand information from contractors and owners about their use of the documents while fulfilling his normal business administration duties. "The amount of changes in this series is more significant than any in the past," he says. "The focus on a fair management and division of risks is what we tried to accomplish. These documents are of a higher quality and will meet industry standards." To access the new documents, visit www.nspe.org/EJCDC.